We spent quite a long time there watching (and of course photographing) the beautiful light show. There were lots of ducks on the water and trumpeter swans in the distance. 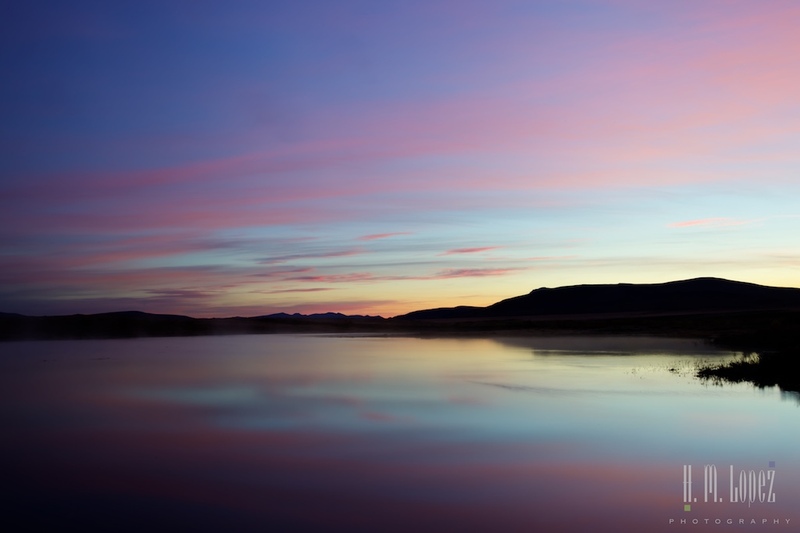 As Hector says, whenever we go out before sunrise, there is always a reward. It may not be exactly what we set out to find, but we are rewarded nonetheless. 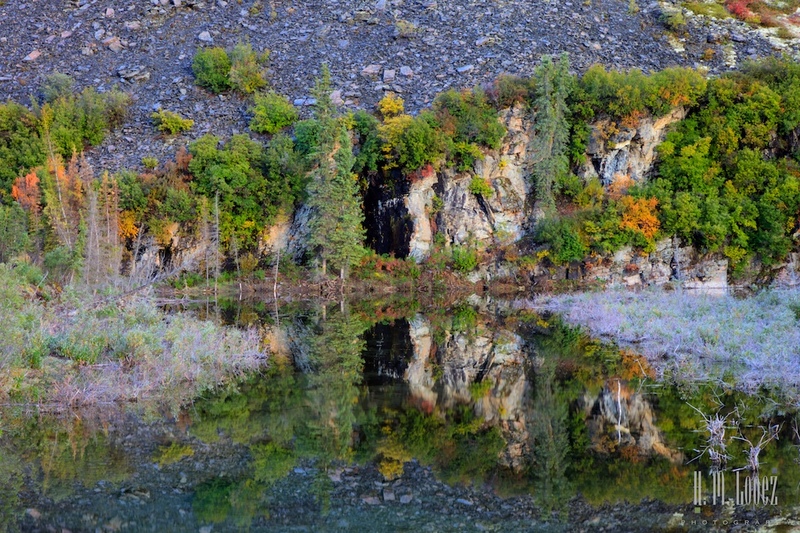 We continued for a bit and stopped again at a pond that was reflecting the beautiful morning light and clouds. 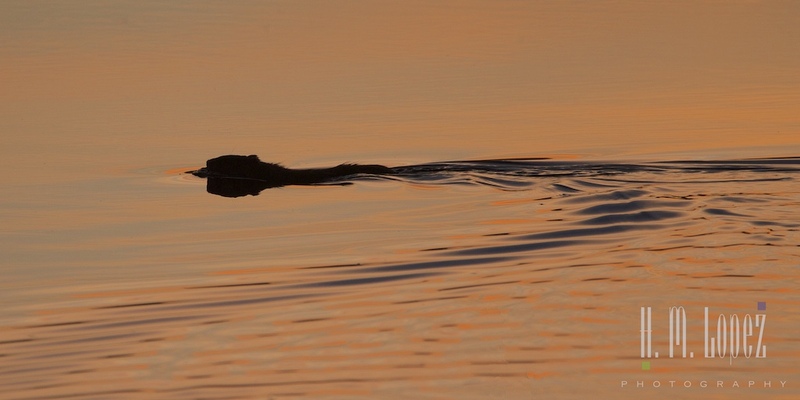 And as we walked over to the pond, a little beaver swam across one way, then turned around and swam back. Our first beaver sighting this summer! At this point, I realized that it had taken us one hour to get twenty miles from our campground. Only 180 miles to go, and then 200 back! But I said nothing and we got back on the road. With the onset of fall, there was frost on the leaves, and Hector did some of his “close to the ground” photography for a bit. 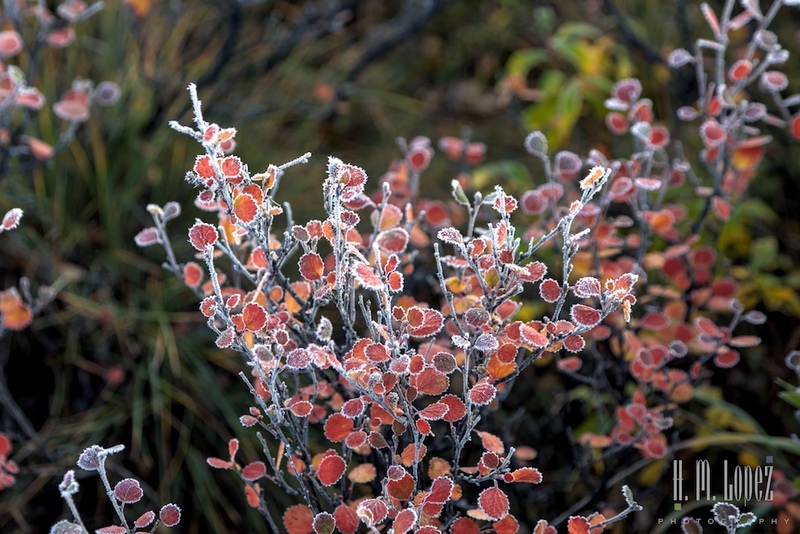 By far, the majority of the landscape consisted of tundra: mosses, lichens, berries and low shrubs that grow in a terrain of permafrost, most dressed in their autumn colors. 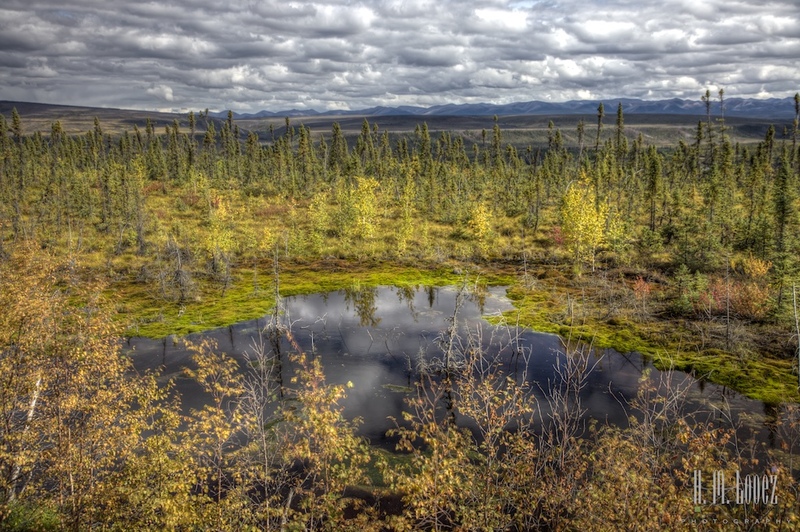 Permafrost, or permanently frozen ground, is a thermal condition in which the ground remains at a temperature below 0° Centigrade and forms a frozen layer in the winter which does not melt in summer. 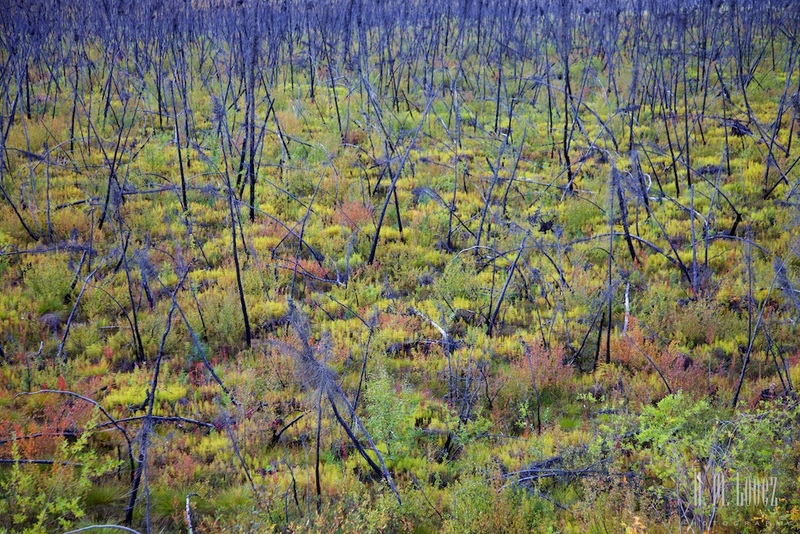 One-half of Canada and about one-fifth of the earth is underlain in permafrost. 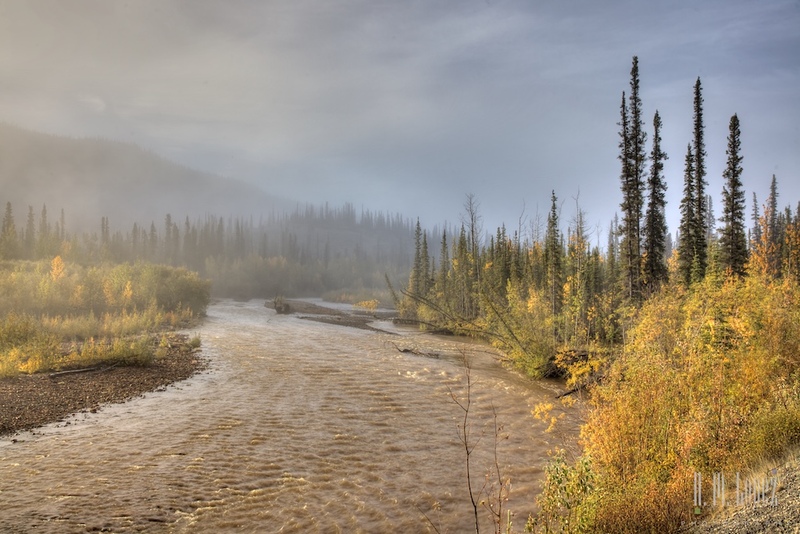 As we continued, we came across various rivers and streams and crossed several passes. 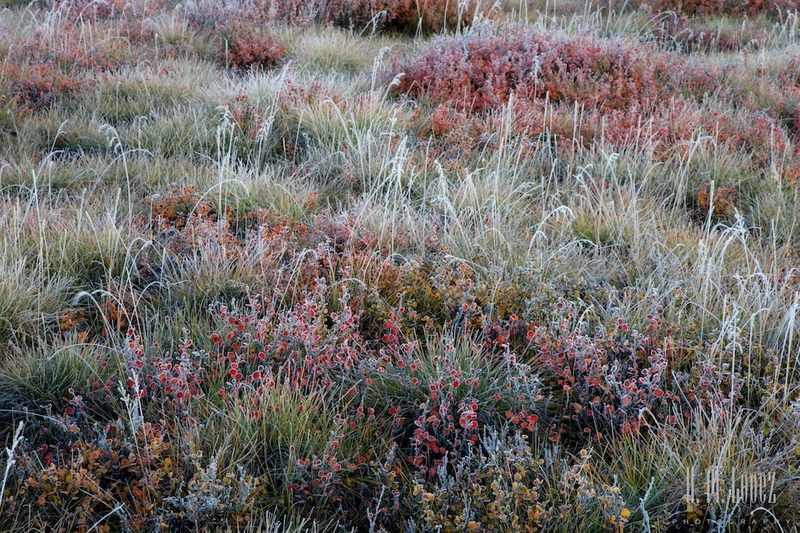 And a variety of mountains surrounding us; some covered in lichen, some completely barren and others partially forested. 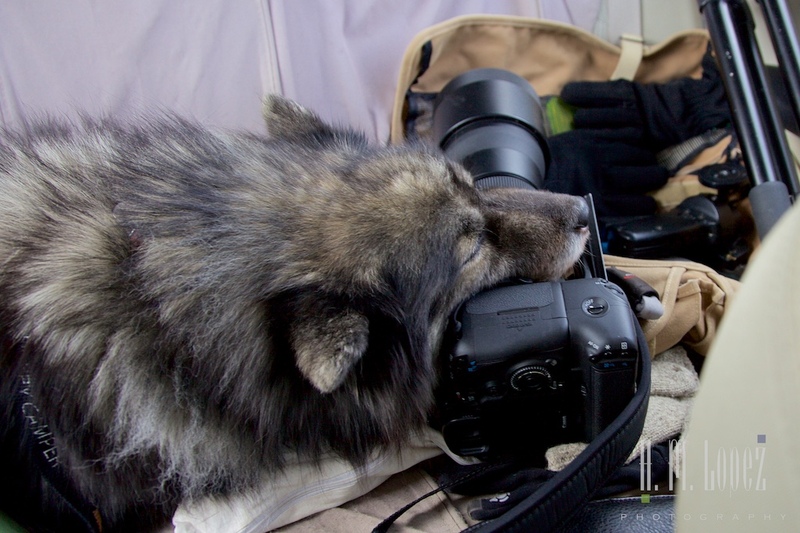 Angel, as always, guarded Hector’s camera fiercely. Since we knew it was going to be a long day for her, we made sure to take her for lots of walks. 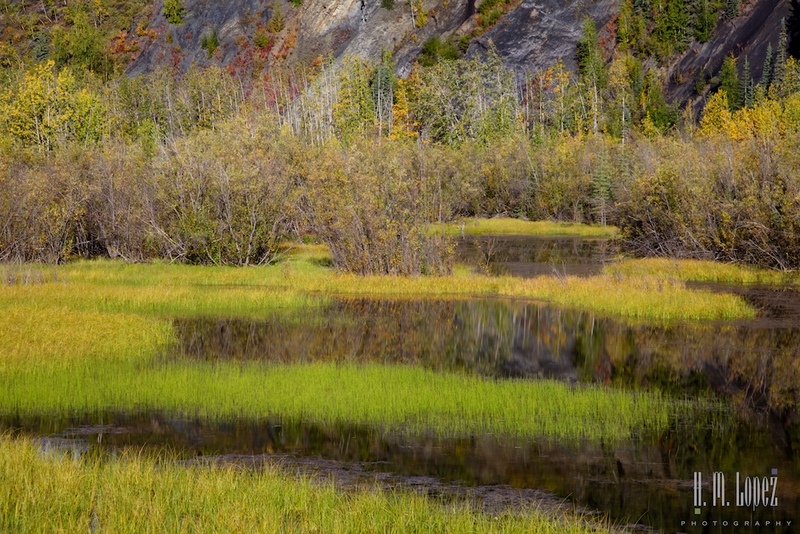 We love that the Canada National Parks, unlike the U.S. National Parks allow you to take dogs on their trails and undeveloped areas. 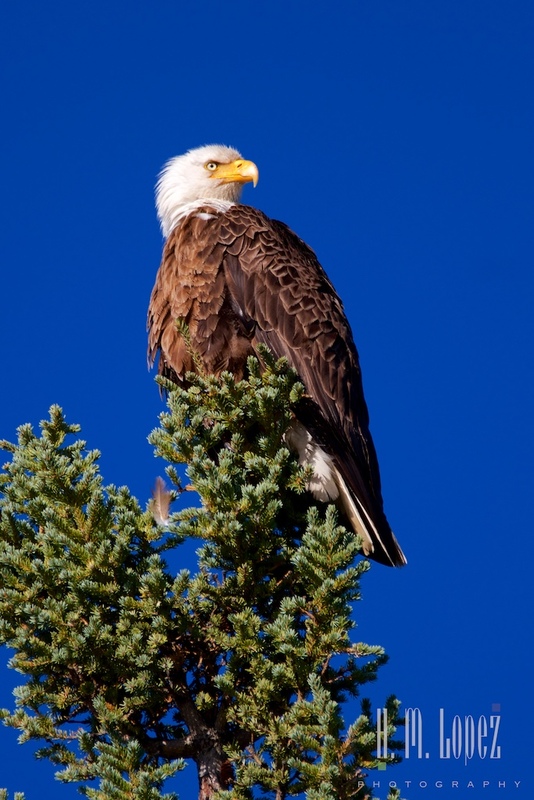 While searching for great gray owls, daytime hunters that reside in this area, we spotted a bald eagle perched on a tree, but no owls. There is lots of wildlife around, we saw two red foxes running across the road, arctic ground and red squirrels, gray jays and other birds we could not identify. But no owls. The condition of the road ranged from well-graded gravel to areas with lots of potholes to narrow sections with soft shoulders. One particularly scary section was sharp shale rock gravel. 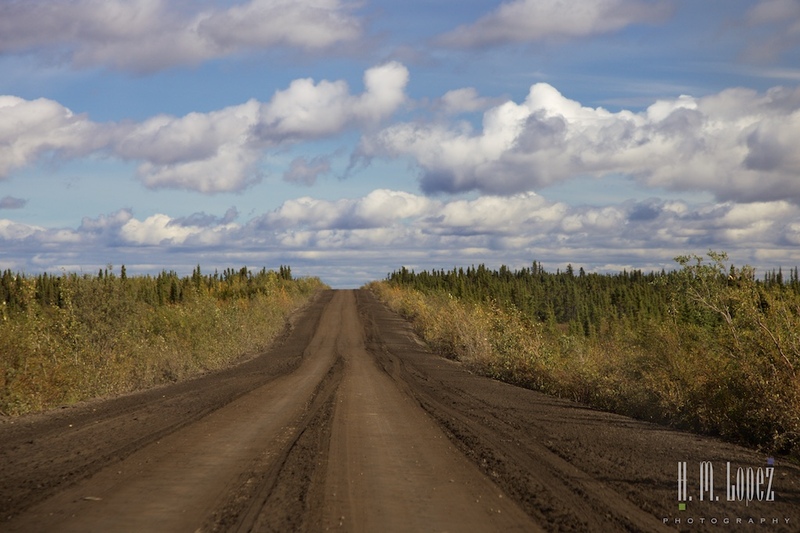 The variation in the road is due to the fact that the road is repaired with the closest available materials, and as the composition of the earth around it changes so does the road. 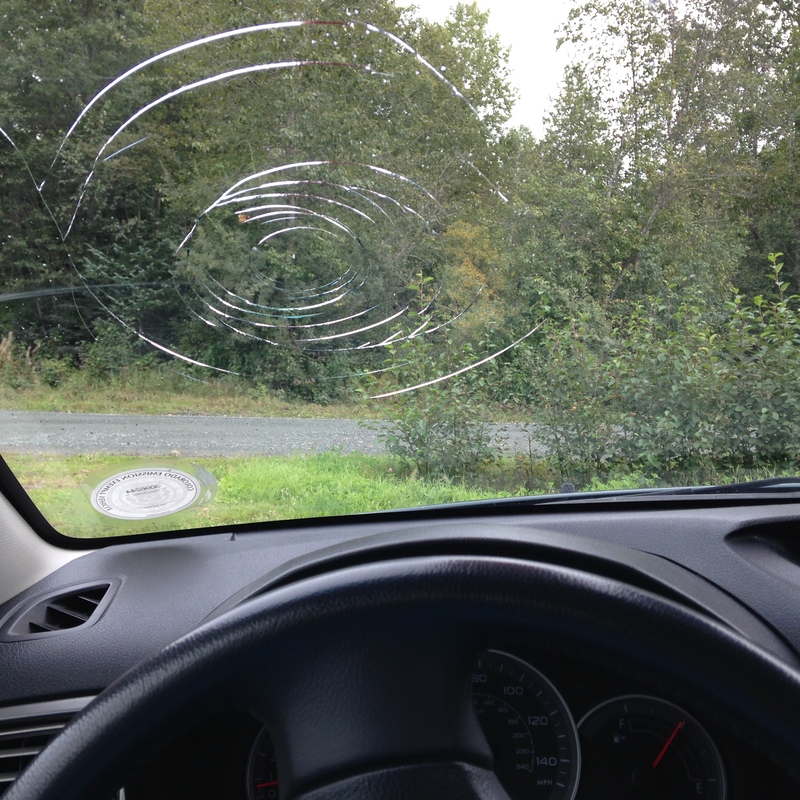 The sharp rock areas are why many cars carry two spares. And why we did not drive Island Girl out to the Arctic Circle. We saw no big motorhomes at all. Mostly truck campers. And we only had what Hector calls a “go-cart” spare and a can of fix-a-flat in the car, so we were not exactly well prepared. 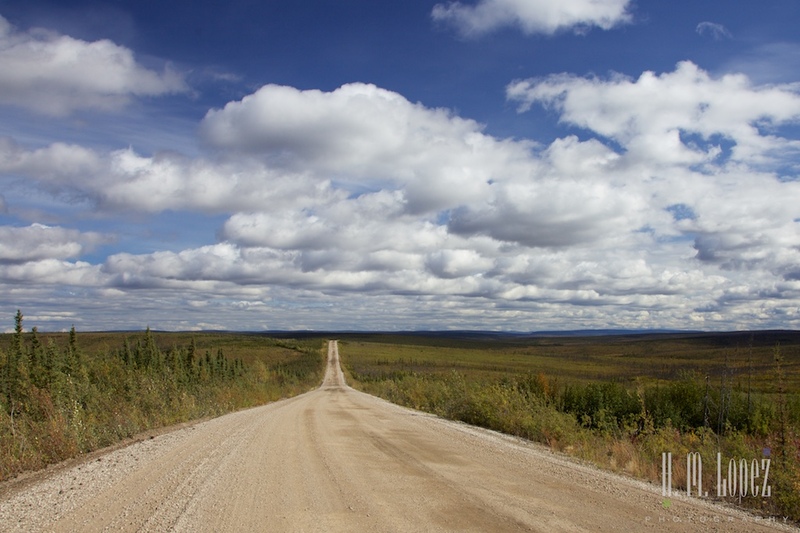 The road is not all terrible, but the extreme remoteness adds considerably to the risk equation. So we took it slow to improve our odds. 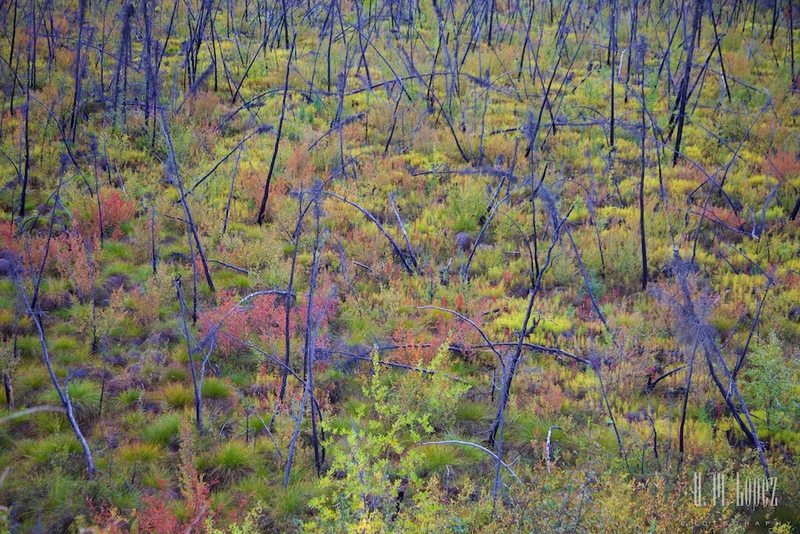 The landscape became much more forested, to the point where there was nothing but trees all around us. 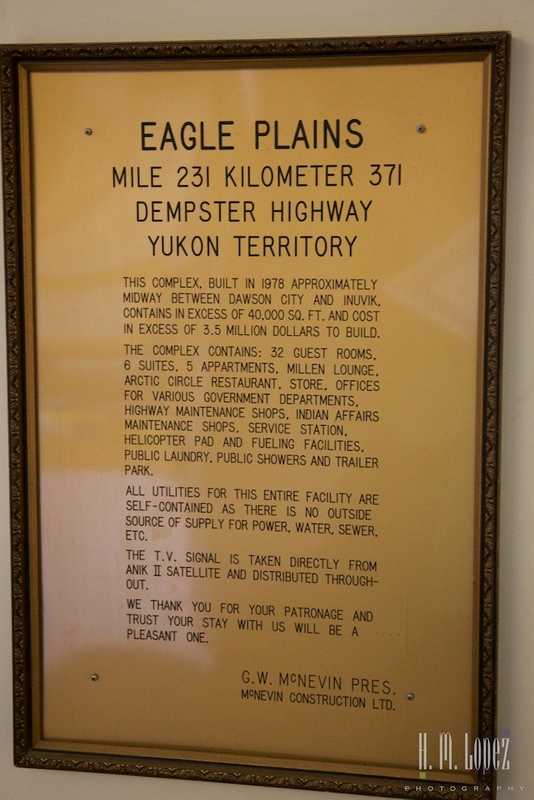 At mile 231, we safely reached Eagle Plains, a complex that was built in 1978 at a cost of 3.5 million CAD. 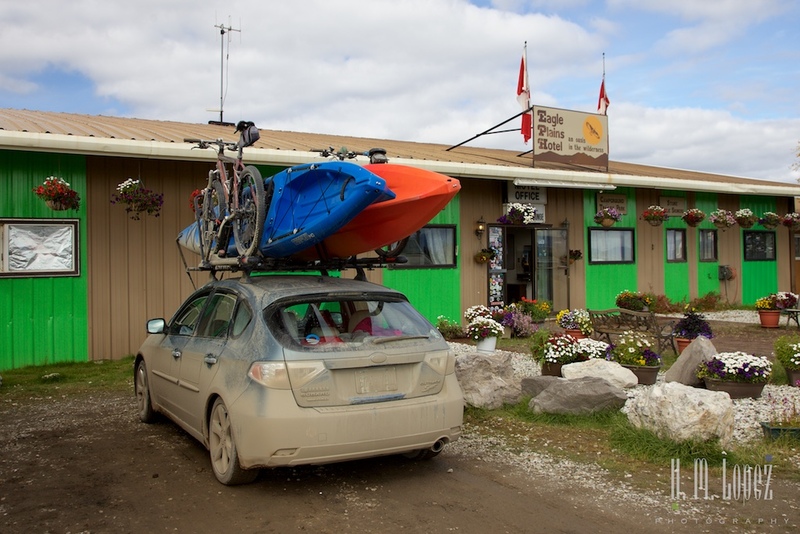 The complex offers the only facilities available for the next 112 miles and is about halfway to Inuvik on the Arctic Ocean. 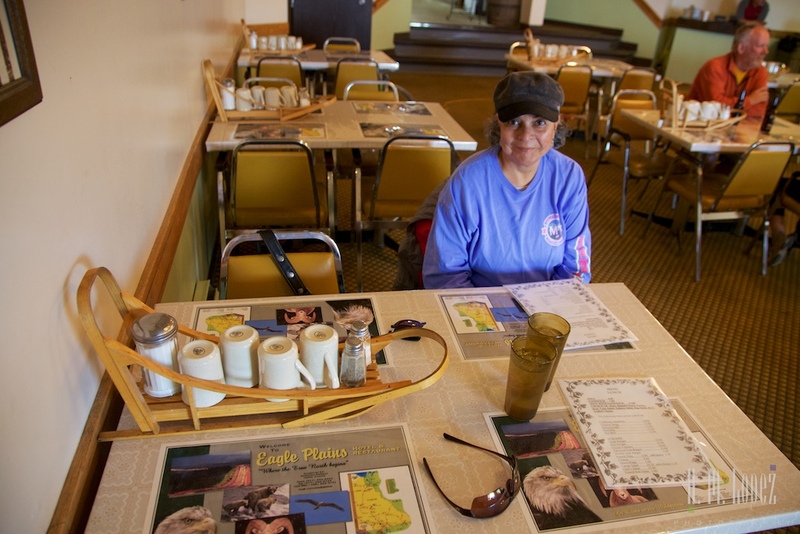 Eagle Plains is a large complex, totally off the grid, self-reliant and amazingly is open year round. Anyone seen the TV show Ice Road Truckers? 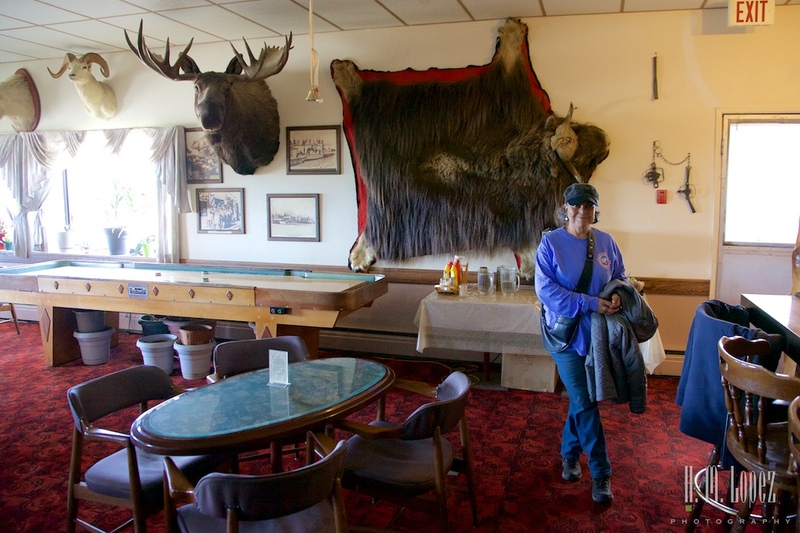 It has a 40+room hotel, a store, offices for various government departments, highway maintenance shops, Indian affairs maintenance shops, a service station, a helicopter pad, a public laundry and public showers. The most lucrative of all, I am sure, is their tire repair service. 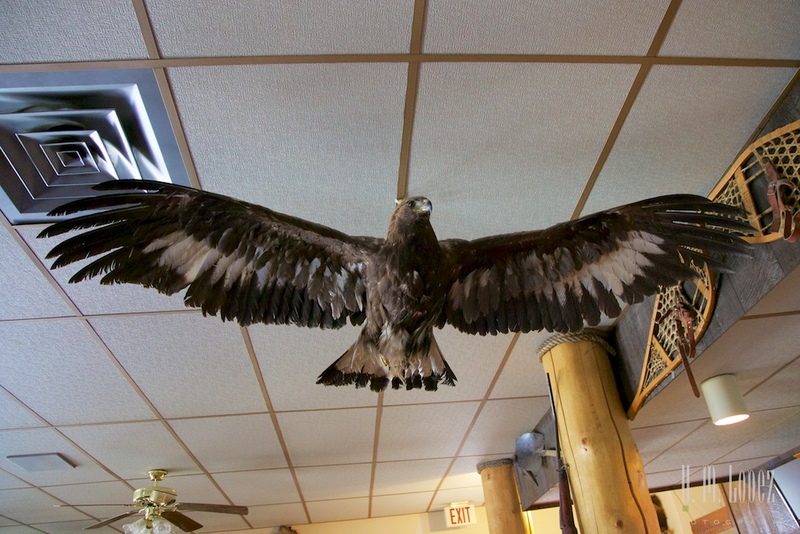 We ate a basic lunch at the restaurant while using their WiFi (satellite based) and then stopped in to check out the bar, a very cool old bar with historical photographs and lots of animal heads. We still had 22 miles to get to the Arctic Circle, so we continued. 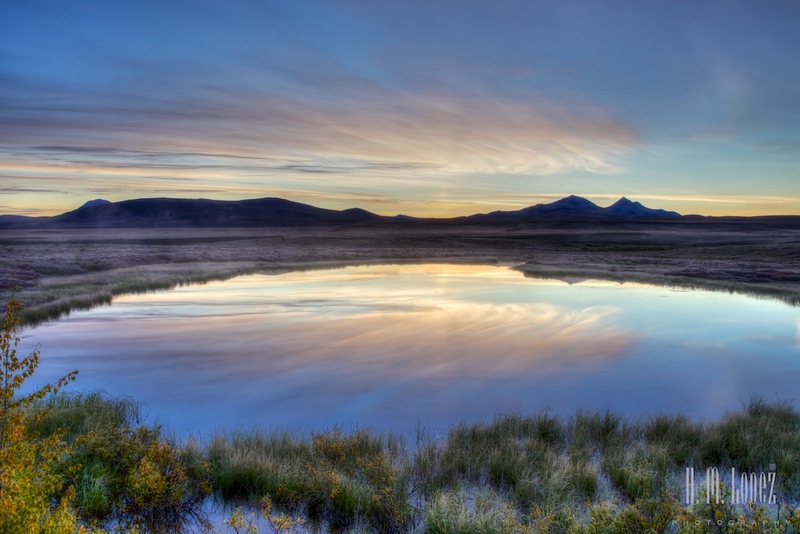 There were lots of beautiful ponds around this area of the road, and we could see more mountains ahead. We reached the Arctic Circle, latitude 66°33’N. 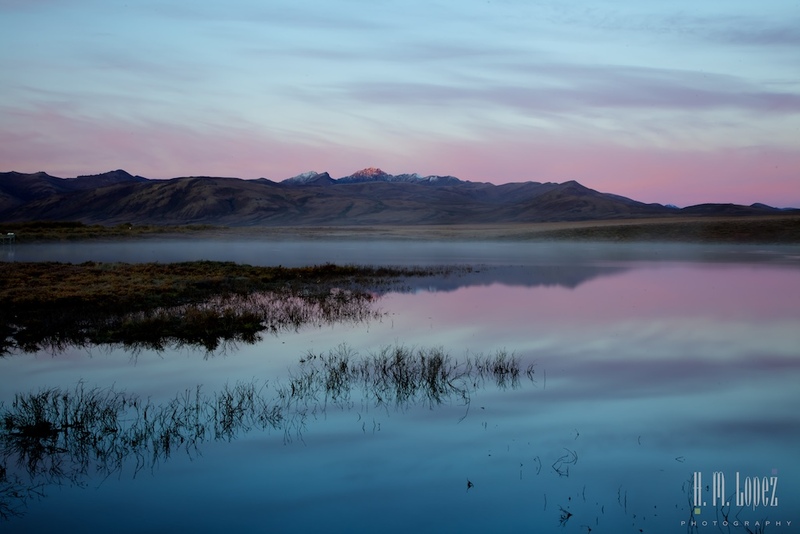 This is one of the most sparsely populated areas on the planet. The Arctic Circle encompasses the Arctic Ocean and parts of eight countries, including Canada where we were. The other countries are the United States, Russia, Finland, Sweden, Iceland, Greenland, and Norway, where we crossed the Arctic Circle a few years ago. 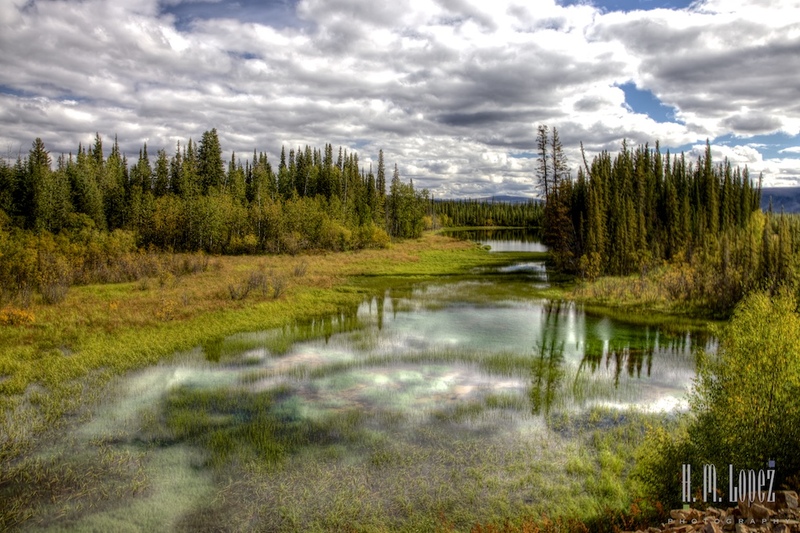 There is evidence that this area has been home to humans since the end of the last Ice Age. 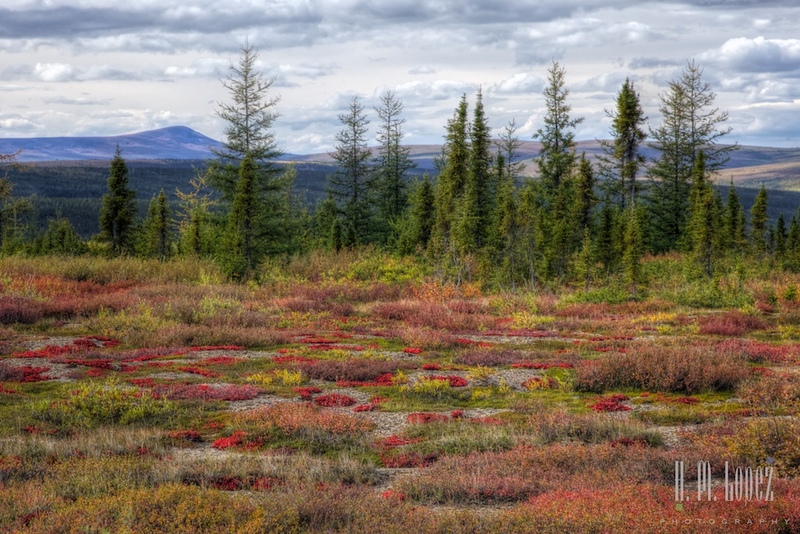 Over 90 prehistoric sites have been identified along the Dempster. 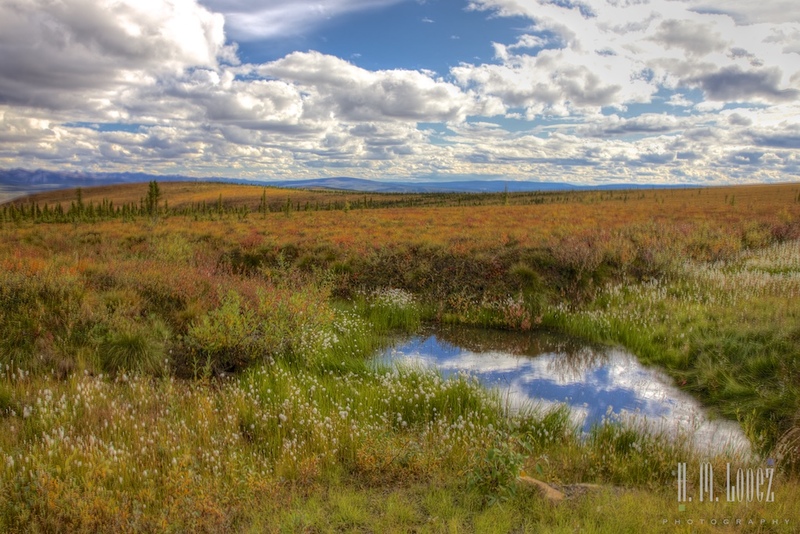 It was the homeland of the Gwich’n, subsistence hunters whose family groups lived in semi-permanent homes. Their history of hunting has continued. 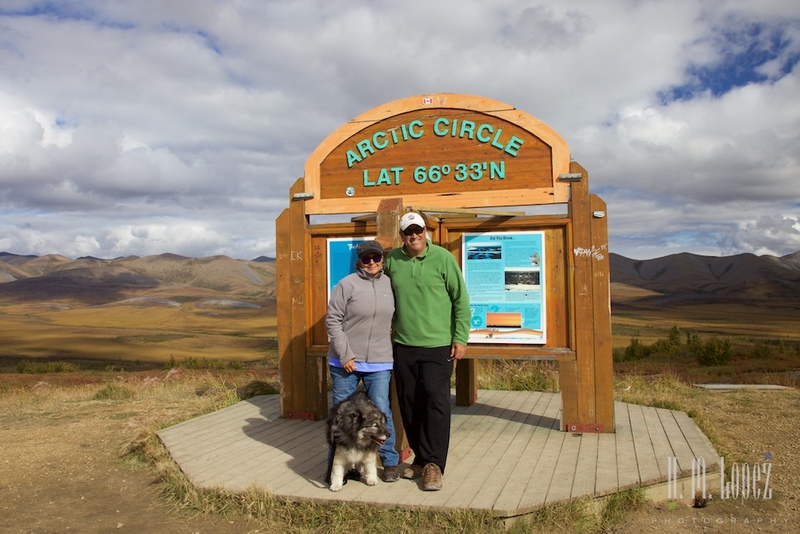 A young couple arrived at the Arctic Circle marker shortly after us and told us that they had a flat tire just before reaching Eagle Plains. But they were able to get it fixed there. 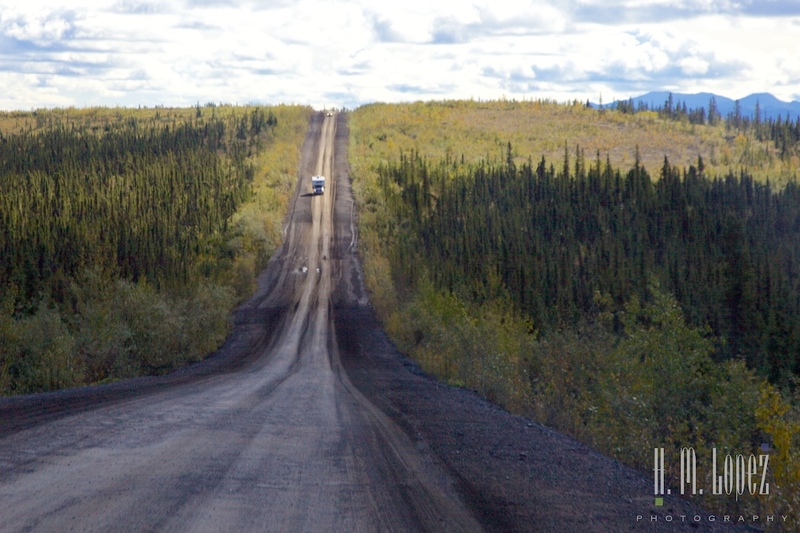 They were headed to another Yukon Government campground that is located just past the Arctic Circle. They looked pretty happy. 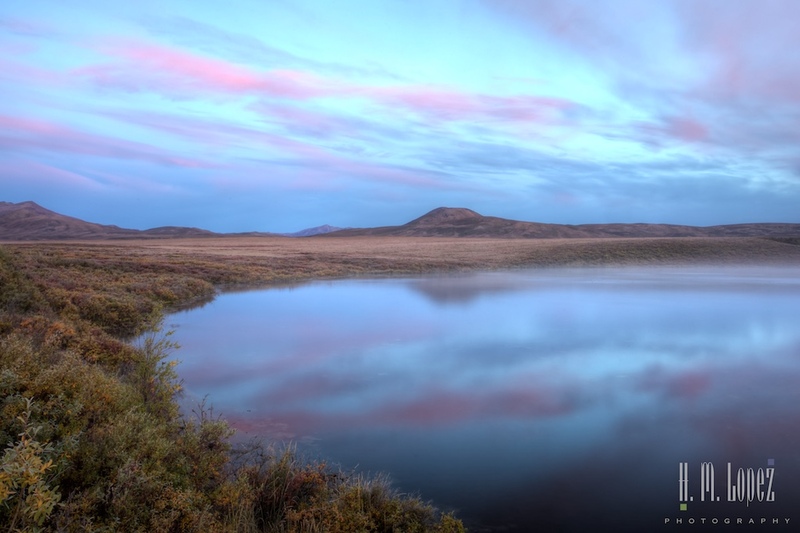 We drove just a few miles beyond the Arctic Circle to check out the landscape. 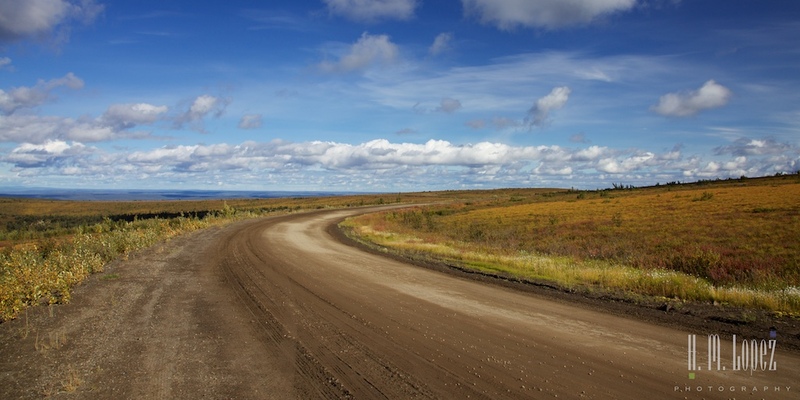 Since we read that about ten miles past the Arctic Circle the road has a section with very sharp rocks we turned around pretty quickly. 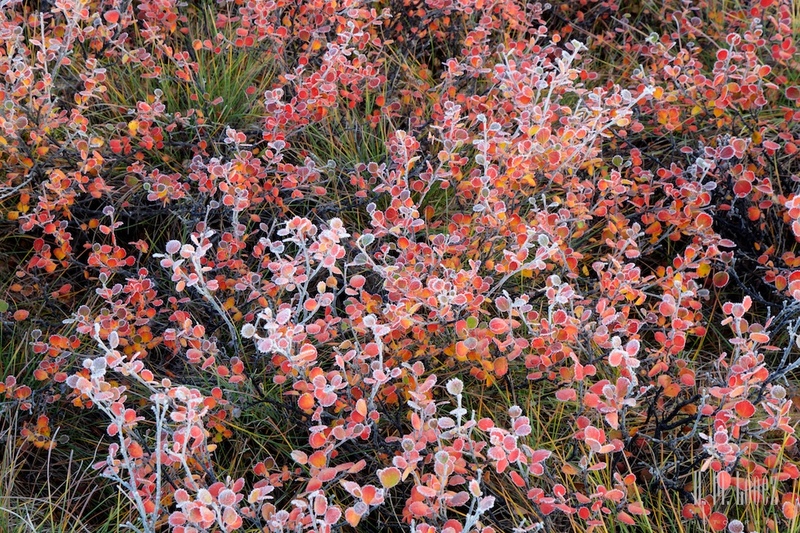 Hector was working hard to capture the beautiful reds of the tundra and the lovely wildflowers. There was a car stopped in the middle of the road, and we stopped and asked the driver, who seemed to be alone, if he needed help. He said his clutch had failed (been there, done that), but a tow truck was coming for him from Dawson, the nearest town, but still about 250 miles away. I wish we could have done more for him, but he was quite cheerful considering his situation (apparently AAA was taking care of it was sure to be a giant bill!) and told us about how this trip had been on his bucket list. A very nice gentleman. 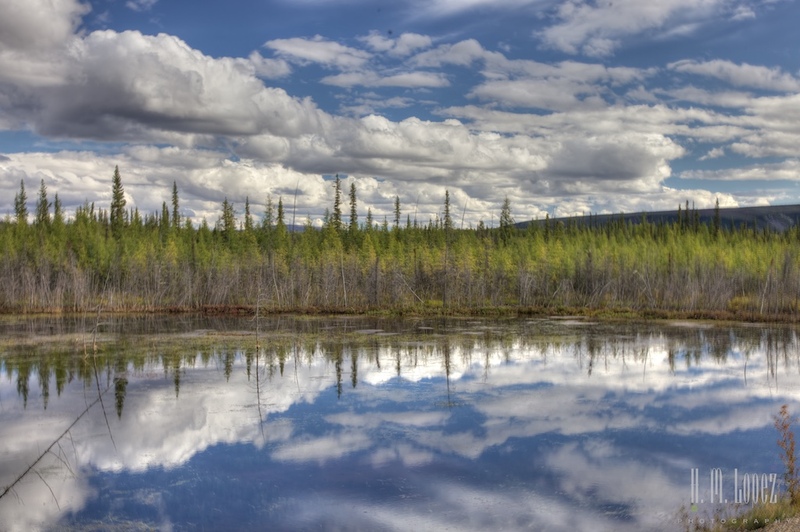 This day was reminiscent of our puffy cloud day in Denali, with the pretty clouds reflected in the ponds. At this point, I was driving and all of a sudden I saw some birds flying that reminded me of the gyrfalcon we saw in Denali. Then I realized that there was a bird in the road ahead of us with a fresh kill, and as I stopped that bird flew off as well. Of course, we knew they were some kind of raptor, but they flew high on the rocks and started screaming at us. I drove past the carcass to what I thought was a reasonable distance and stopped. 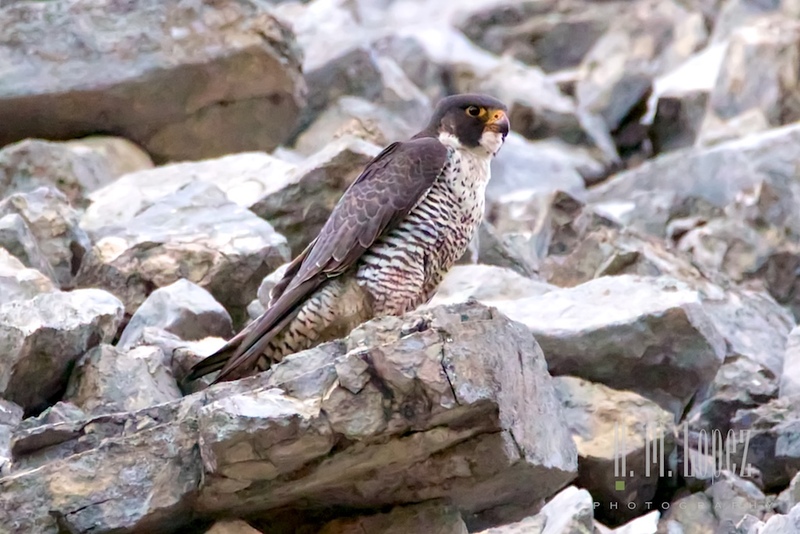 Hector got out and photographed one of the birds who perched up high on a rocky cliff. A couple of others were circling around. 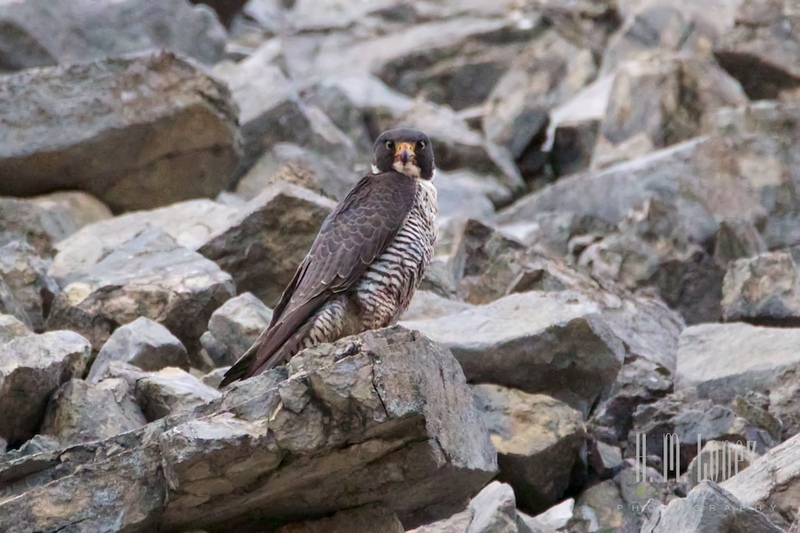 We figured out that they were not gyrfalcon but peregrine falcon. 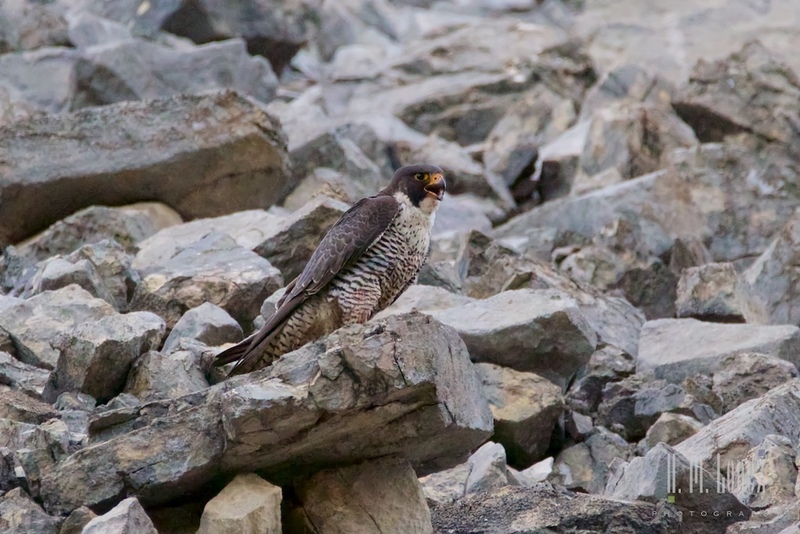 Peregrine falcons can reach speeds of up to 120 miles per hour when they dive. 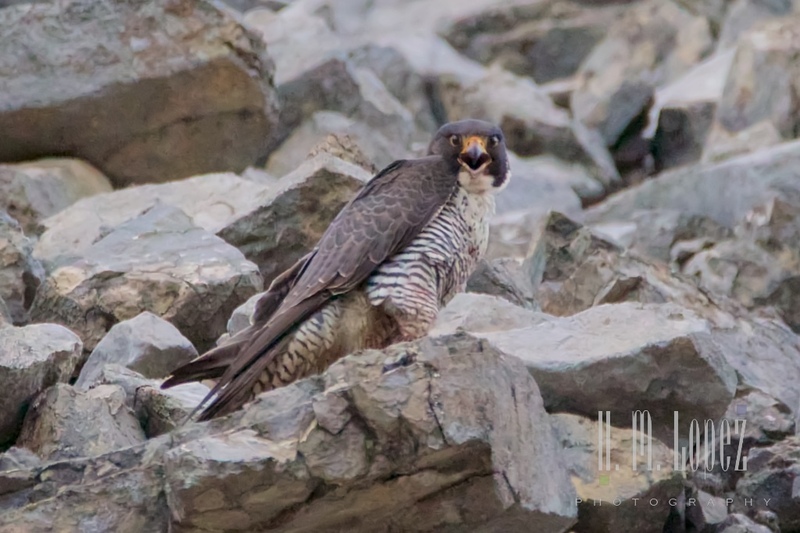 We had not seen any peregrine falcon yet this summer and never this close up so this was exciting. But they kept screaming and would not go back to their kill, so we left after a short while. 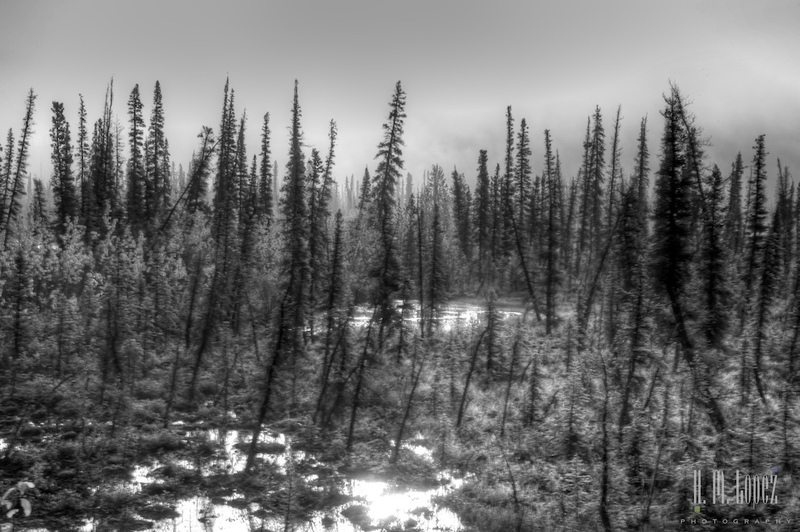 Shortly thereafter, I spotted a cow moose by the side of the road drinking out of a stream. She raised her head to look at me, and hurried across the road. And of course disappeared in some trees. It is amazing how these giant animals can disappear so quickly. 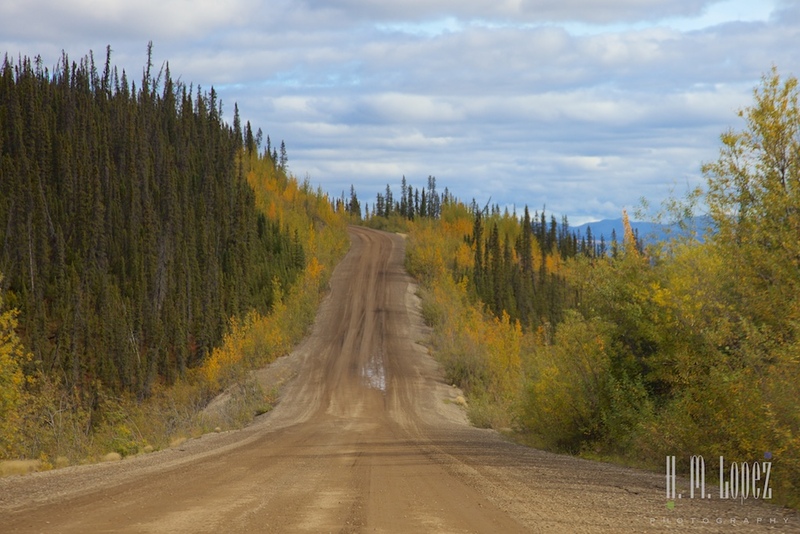 What was also amazing was that we had read that moose were almost never seen near this road except at Two Moose Lake occasionally (where we never saw any moose). So it was a pretty cool sighting. Shortly thereafter a tow truck drove by towards Eagle Plains, we assumed to rescue the gentleman we had met. This was about two hours later and he still had about an hour’s drive, so we confirmed that there is a long wait to get help on the Dempster. Hopefully, all turned out well. It was getting too dark for photography and Hector took over driving again. So he sped up as much as the road allowed. And we arrived at our campground just before 11p.m. one hour before my prediction. And 18 hours after we left. A very long, but very rewarding day. 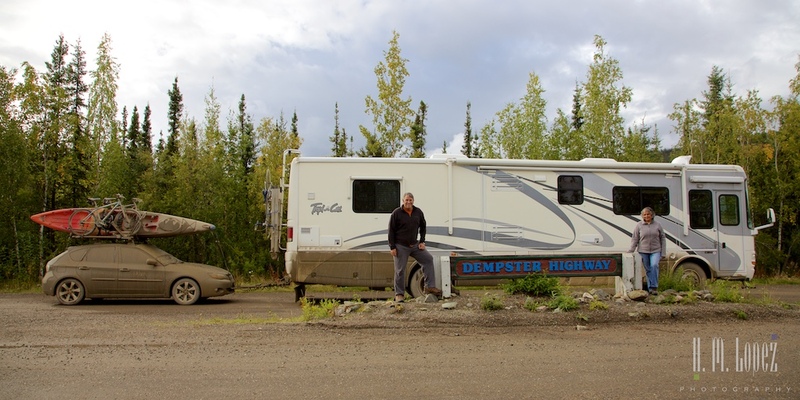 On the next day, we drove Island Girl back out on the Dempster, and, although she and the Coquí were covered in mud, we were pretty pleased to have survived the scary highway almost in one piece. 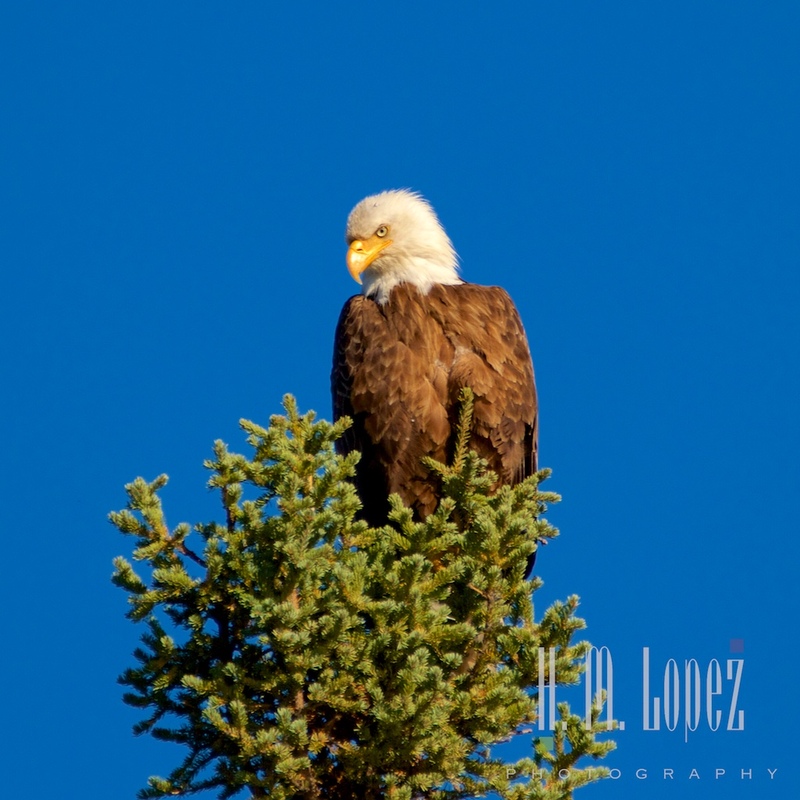 This entry was posted in Canada, Our 2015 Journey to Alaska, RV fulltimers, Yukon and tagged autumn, birdwatching, covered bridges, dry camping, forests, mountains, raptors, Roads, sunrise, wildlife by islandgirlwalkabout. Bookmark the permalink. What a day! 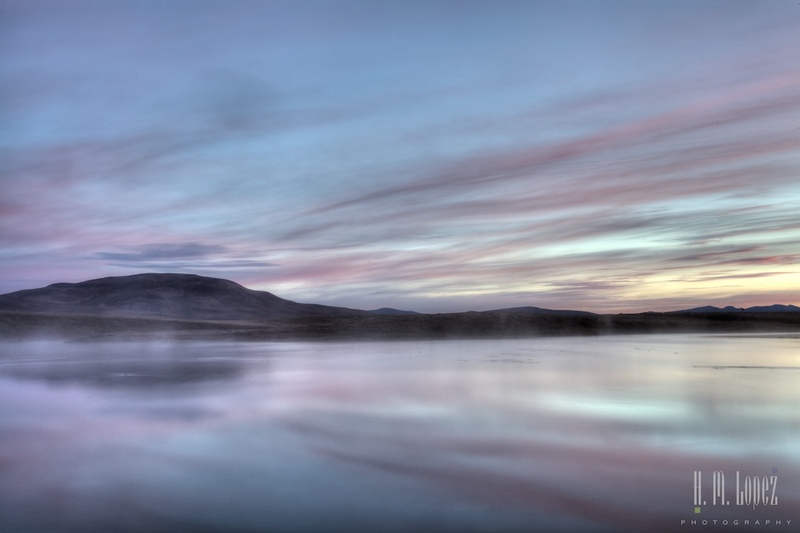 I love the early morning photos with the fog on the lakes as the sun is rising. But my favorite photo is right after you mentioned turning around for the sharp rocks in the road. 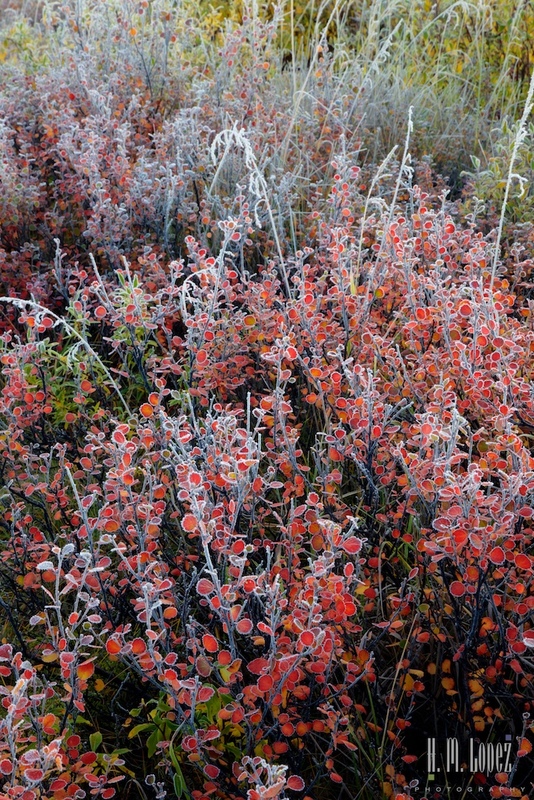 The colors of the tundra are just spectacular, especially the reds. What a photo:) Boy, that is some mud!! 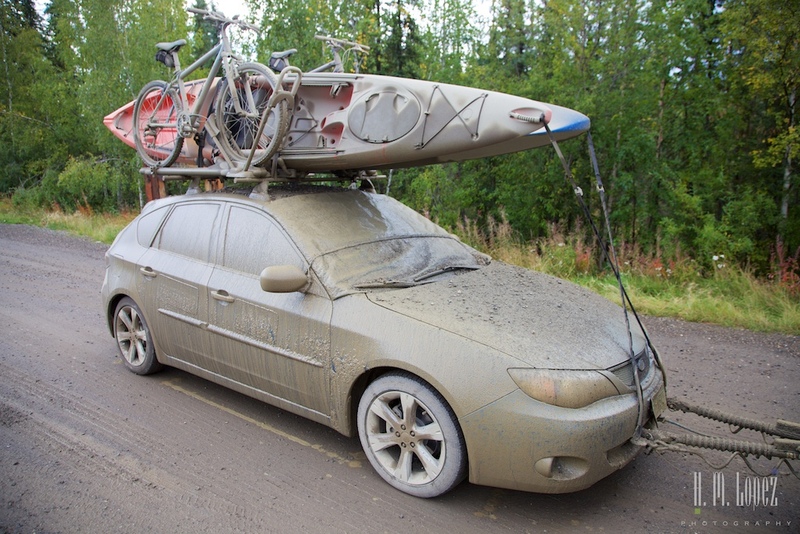 It must have taken forever to get all the mud washed from underneath the MH, not to mention the car, bikes, and kayaks! Sorry to see you windshield. You continue to amaze us with your adventurous ways. 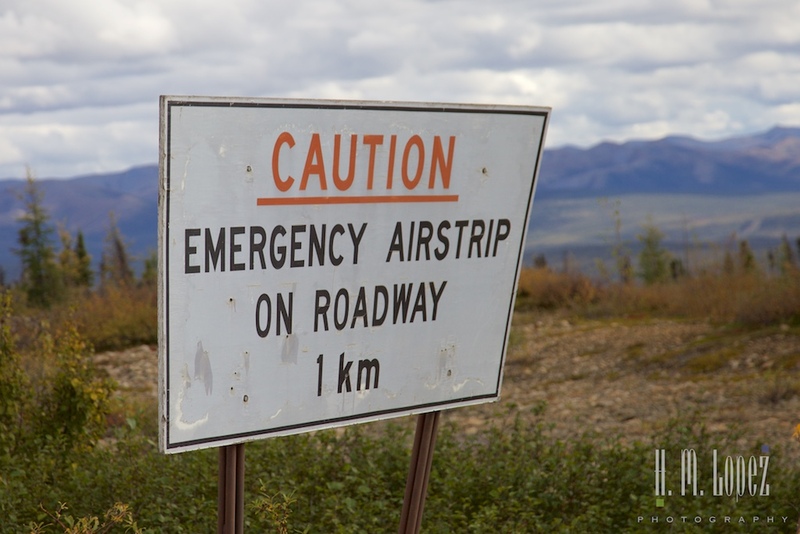 I would be concerned all the way up the amazing highway. Can’t wait to hear more. Travel far and travel safe. Some great shots! A very sucessful day, to say the least. Wow, just wow. 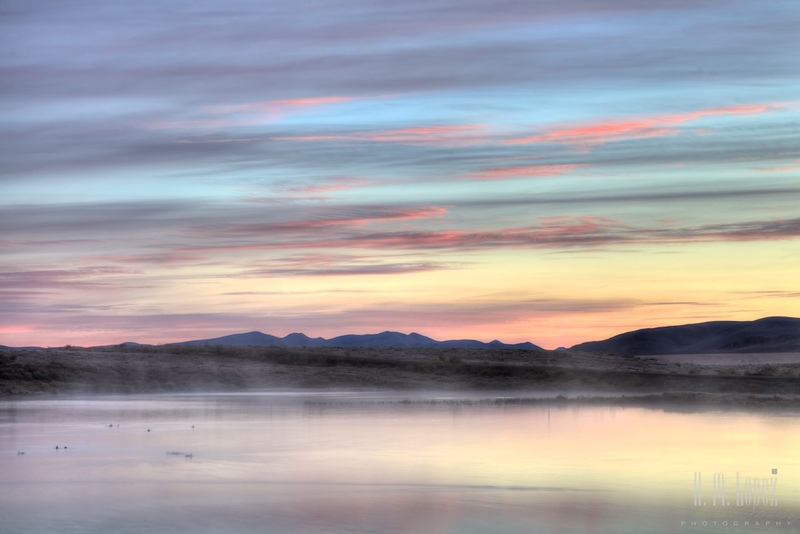 These photographs are spectacular! So glad to see Angel doing so well too! Thanks, Russ! She is wonderful! Wow! Very energetic you three! Is that a new windshield break? At least it IS impressive. Aren’t the changing seasons fantastic?! It is a new windshield break, we now have three! Glad we didn’t get it fixed after the first. Yes, we are very much enjoying fall. Still in Hyder and probably leaving tomorrow. That final picture shows me what “covered in mud” really means! Yes, it was pretty much the dirtiest our car has ever been. Wow! as always. Spectacular. 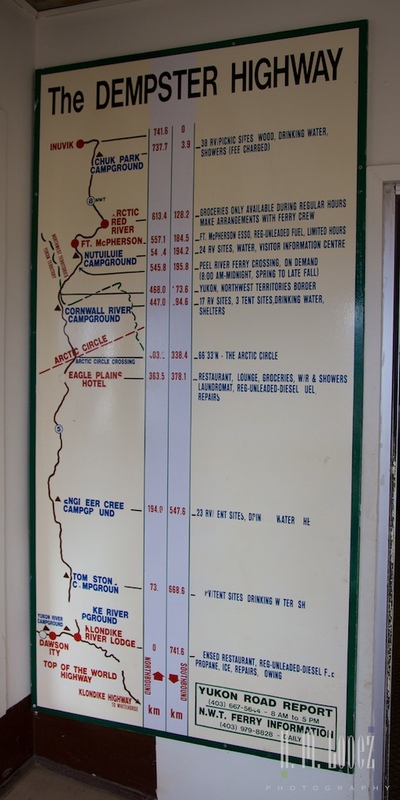 How many folks get to cross the Arctic circle more than once in their lives. 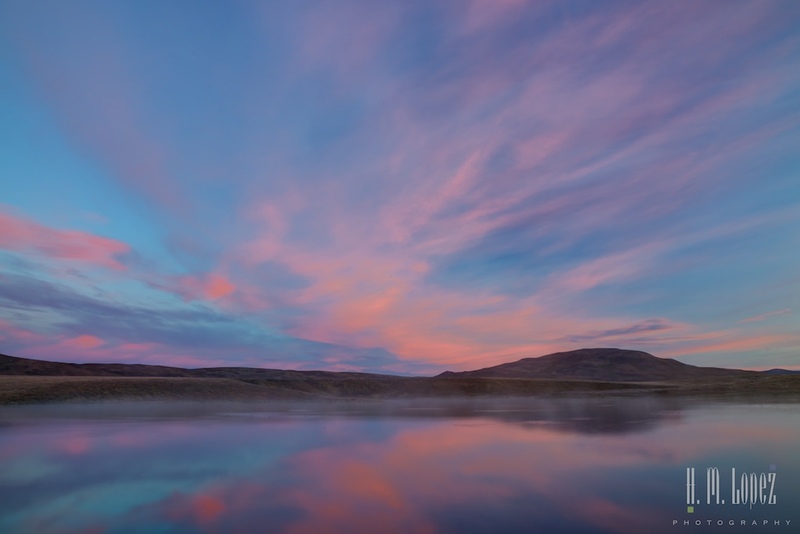 Love the beautiful photos, but what does “predawn” mean? Especially as far north as you are?? Great photos and what a memorable trip!!! This time of year the days are not as long, sun is setting around 9p.m. and rising around 7a.m. It’s nice for us because we can actually get sunset and sunrise photos without much effort. You are very brave and adventurous but aptly rewarded of your efforts. Breathtaking scenery! I can imagine how long it took to wash Coqui 🙂 and everything else. 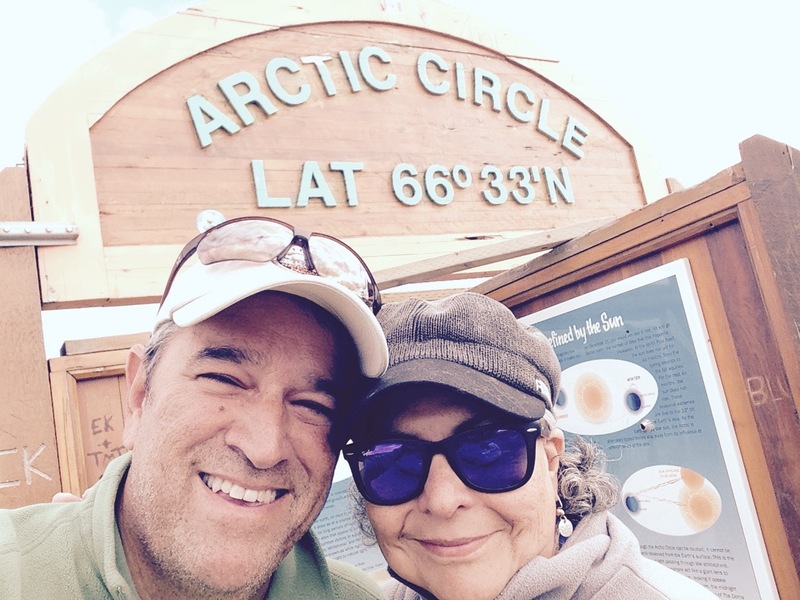 We took the easy way to cross the Arctic Circle, a 19 hour tour! And in our tour there was also a car that had a problem on the road and our tour/driver stopped and helped the stranded car. 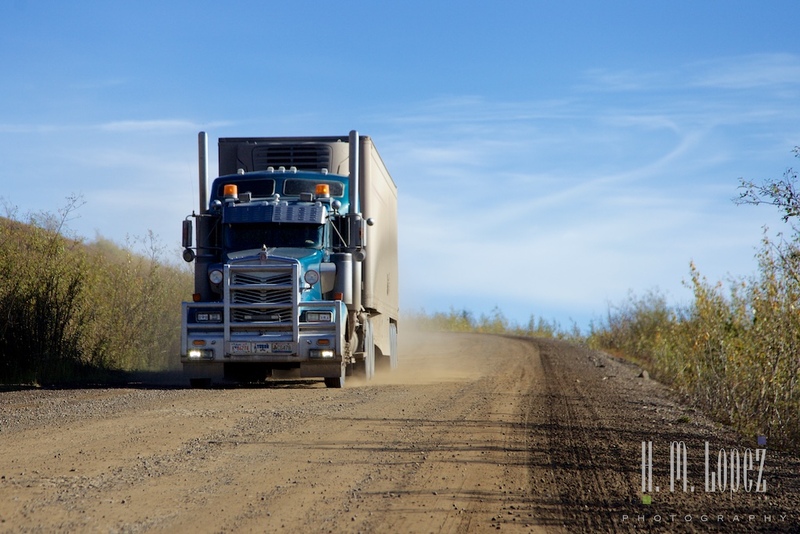 Oh, yes, I think you went on the Haul Road right? The mud was tough to get off, but we are not doing a really thorough wash for awhile, since it has been raining a lot. Beautiful morning shots. It is so hot down here, wish we were still up north. Thanks! I’ve heard about the heat, not so up here. Your reward for such a long day was some astounding scenery. Thanks so much for sharing. So this makes two broken windshields, right? I’m sure it could be worse. I can’t imagine I could talk Terry into such a long drive. Yes, two broken windshields and a few more items. But it has been worth it! We did that with our kids in1994, stood by that Arctic Circle sign and then turned around and drove back south. Incredible place! Yes, it was incredible, so glad we made it!